The work Repetition is the mother of knowledge (“Ponavljanje je majka znanja”) constists of a writing on a wall, four related video clips, and one spatial installation. The writing on the wall consists of a sentence which describes one of the features of a biological developmental disorder of the brain, autism: “(...) individuals afflicted with autism display various forms of a repetitious and limiting behavior (...).” Each of the individual video clips shows the process of crumpling, discarding, smoothing, and writing on an A4 format sheet of white paper. 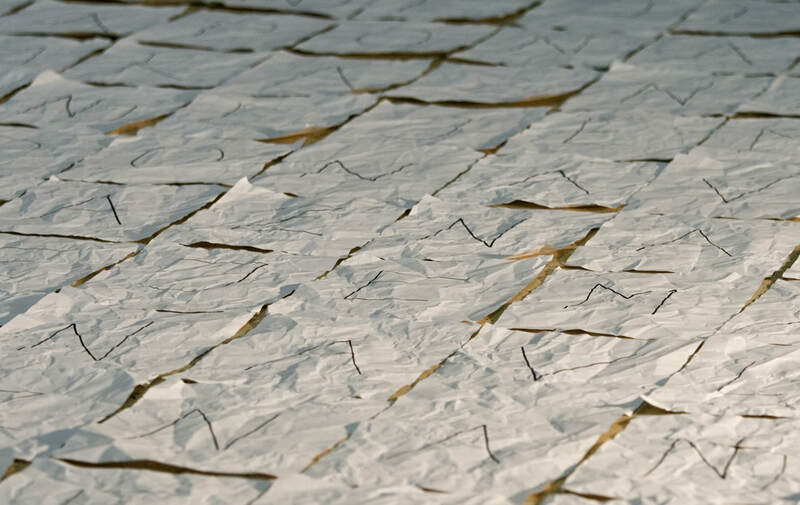 The spatial installation consists of the sheets of paper which have been put through the described processes, and are displayed next to each other in the gallery space, so the written letters on each individual sheet of paper form the sentence “Ponavljanje je majka znanja.” The sheets of paper cover a great area of the floor of the gallery, and show recognisable evidence of being put through the process shown in the video clips. The title of the project clearly indicates that repetition is the element to which attention needs to be paid. Generally speaking, repetition is a process in which a particular action is performed several times in a row, and consists of a central theme around which other processes are created and developed. Repetition in the context of the presented hypothesis (“Repetition is the mother of knowledge”) is perceived as a positive action. The writing which depicts one of the features of autism, considering it is a developmental disorder, automatically puts repetition in the context of the negative. Through pondering over the process of repetition through the sphere of the artist and art, the question of the meaning and possible contradictory connotations imposed themselves on me. Observing the development of art, we notice that the majority of artists (after finding their own expression/motif/technique) continuously repeated certain elements in their work. Should we observe ourselves for a moment, we would also notice that we constantly repeat certain things. By connecting this revelation with the sentence which describes one of the features of autism, we might recognize the traits shared by the artist and an autistic person. Facing a work which bombards us with repetition in two different contexts is confusing, and the loud noise of the processes of crumbling, discarding, smoothing, and writing on paper contributes to the confusion of the situation. In this case the sheets of paper and repetition have multiple meanings; the books we use to study contain paper sheets so they literally represent something that stores information, the matter onto which everything we are supposed to know is deposited. The audio-visual process of crumbling, discarding, smoothing and writing on paper (repetition) metaphorically represents the manner in which we adopt knowledge, process it, and enlighten through our psycho-physical development, and then after a while discard or apply our knowledge. This feature of autism and repetition in the service of knowledge form sentences which the viewer can interpret as false, absurd, but also completely true at the same time. Although the writing which the viewer finds on the wall alludes to illness/disorder, the sheets of paper which form the sentence equate the positive and negative connotations and perhaps form a question of whether repetition is a path that leads to genius, or insanity/mental illness. Is repetition truly the bearer of knowledge and where can it be found, and is there a boundary between genius and insanity? Who and what are we as artists, do we repeat to say, learn, remember something, or is our repetition but a beginning of an illness that has not been diagnosed yet?